On the 10th march 2017, MAAME YAA KWARTEMAAH ASANTE who is popularly known as Hon. MAAME YAA (MISS PEACE AMBASSADOR GHANA 2017) had a live exclusive interview on 7Plus TV exactly at 10am in the morning, hosted by MAMAA ABA ASENEWA. 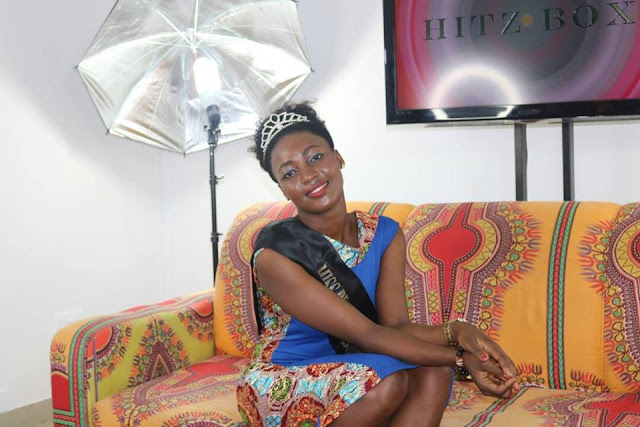 This interview was all about her, MISS PEACE AMBASSADOR GHANA as a pageant, her project which is (RELIGIOUS CONFLICT and its effect on our socio-economic and political environment) and her future plans. The Queen educated us on her project and stated that RELIGIOUS CONFLICT is one of our problems in the country and we need to do a lot of education on it to reduce it because PEACE is not PEACE until there is total peace. She further explained that, in Ghana, Muslims and Christians have lived as one people because of inter marriages, working environment, schooling together, etc. She continued by saying the constitution of Ghana provides for freedom of religion, and the government generally respect this right in practice. Government policy continues to contribute to the generally free practice of religion, Maame Yaa added. . The generally amicable relationship among religions in society contributed to religious freedom, however, tensions sometimes occurred between different Christian and traditional faiths.One religious conflict that quickly come to mind is the conflict between the AL- sunni and Orthodox/ Traditional Muslims in werchi which occurred in 1995, 1997, 1998 with most recent ones occurred in 2012 during the month of Ramadan. Another issue is the conflict between the evangelical Presbyterian church and the Global evangelical church. The Disagreement was about some rather light doctrine, especially the move by some break-away members to introduce Pentecostal charismatic models of worship into the Church which were gaining ground throughout the country. Yet another instance is the disagreement between the inhabitants of the Gbi traditional area (Hohoe) and Muslim community in the Volta region with respect to this few incidents in Ghana. It has had a huge toll on our political stability. So her tour is intended to draw a large number of students and inhabitants in the various communities which she will visit within the ten regions. She added that, the idea is to get the youth enlightened about how Ghana iis not in isolation from these incidents which are happening in the world. People have become refugees in Nigeria, lraq, Egypt, just to mention few due to this Religious Conflict. When the Queen was asked about her private life as to whether she was dating? She said “yes, I have 2 boyfriends”. Host Mamaa Aba got shocked instantly, and out of curiosity wanted to know who those two lucky men were. MAAME YAA dropped the explosive but interesting answer when she said her first love is JESUS and the second one is her FATHER. Next for massive support, MAAME YAA invited all religious leaders, the government and everybody to her “Reduce Religious Conflict” project train. She aims at making her projects goals achieved in all African countries and everywhere in the world. Hon MAAME YAA thanked the BREAKING YORK INTERNATIONAL CHURCH for their great support, national chief imam for his supportive prayers, Parliament Chapel International, her lovely father (Mr Yaw Asante), her family, ministry of interior, Ghana peace council, her management (PROJECT REWOUND ENT. ), OB ONE ENT. QUALIVENT and everybody that supported her from day one. All other social media handles:Miss Peace Ambassador Ghana 2017. Personal Facebook - Hon. MAAME YAA or call/ WATSUP 0241433978. Thanks.